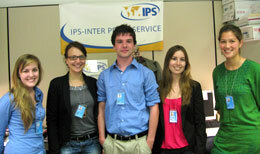 The IPS UN Bureau has an internship programme for a minimum of four weeks and a maximum of three months. The programme is open primarily to those aspiring to be journalists — and specially those interested in covering UN-related issues, including poverty, human rights, health care, refugees, children, disarmament, peacekeeping, gender empowerment and sustainable development. Left to Right: Portia Crowe (Canada), Verena Schaelter (Germany), Denis Foynes (US/UK), Cleo Fatoorehchi (France) and Elizabeth Whitman (US). The internship, which is unpaid, provides our interns access to UN press briefings, General Assembly and Security Council meetings, UN seminars and NGO meetings held at the Secretariat. 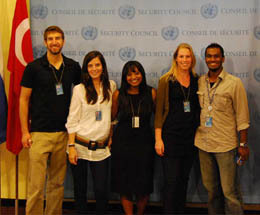 Our interns also have opportunities to conduct interviews with UN diplomats and senior officials in the UN system. The internship not only provides insight into the inner workings of the Organisation but also gives our interns an opportunity to report on issues of global concern. On average, we have had three to five interns working daily in the IPS Bureau located in Room S-407 of the UN Secretariat. Our interns have come from Afghanistan, Australia, Brazil, Britain, Bulgaria, Canada, France, Germany, Greece, India, Italy, Mongolia, Nepal, Netherlands, the Philippines, South Africa, South Korea, Spain, Sri Lanka, Sweden, and United States. Our web site can be accessed at: www.ipsnews.net. As with most news organisations at the UN, our interns have to pay their way to New York and find accommodation on their own. Because the UN’s Department of Public Information, on instructions from the U.S. State Department, insists on an I-visa (I for information) for UN press credentials, we provide a letter to the respective U.S. Consuls to facilitate the visa process. This rule, however, does not apply to students with U.S. passports or those with permanent residency status in the United States, who do not need visas. Our internship programme is best suited to students (at the Bachelor’s or Master’s Degree level) who are following academic courses in journalism, media communications, international affairs or environmental studies. All applicants need to have strong writing skills in English and also the ability to produce copy on rigid deadlines. Besides news coverage, interns are also expected to support the overall functioning of the IPS UN Bureau through tasks such as research, fact-checking, monitoring the usage and publication of stories, and support events held by IPS at the UN. Please send us your CV, along with writing samples of two or three recently-published articles.